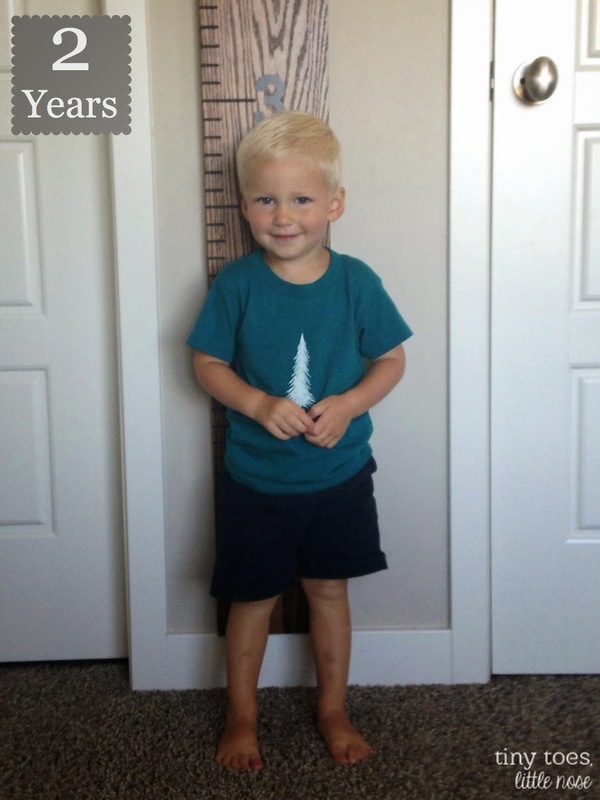 shirt from Alpine Baby Co.
Stats: Height 35.93 in (86%). Weight 24.91 lbs (14%). Head 18.9 in (32%). Favorite Foods: Avocados, quesadillas, hummus, & yogurt. Breastfeeding: Still going strong! Naptime, bedtime, & an occasional in-between time. And we still have days where he wants to nurse as much as I will possibly let him! Ah, the unpredictability of toddlers! You can read more about my thoughts on breastfeeding a toddler here. Signature Phrases: "Holy Moly!" & "That's a big one!" Favorite Toys: Puzzles. So... Many... Puzzles! He started with some small simple ones and has worked his way up to 25 piece puzzles all on his own! You can find his favorites here , here , and here ! Favorite Song: "Happy" by Pharell AND the Washington Husky fight song, "Bow Down to Washington". He is quickly learning it and will sing along with us. We even hear him singing it on his own at times or some other random song he has made up! Favorite Activities: Slides (particularly the water variety) & digging in the dirt! Sleep: Unfortunately, his sleep situation is almost identical to what it was a year ago... Takes 1 nap around 1pm, during which I lay with him. Then he roughly sleeps from 9pm-8am. He starts off in his own bed, but joins us upon his 1st or 2nd waking. Still wakes about every 2 or 3 hours, although his longer stretches of sleep are becoming somewhat more regular. However, if I am writing this same bit come his 3rd birthday, I will be the most sleep deprived woman in the world! He is gentle & so sweet. He has lots to say and can hold a conversation. He is stubborn. He is curious & inquisitive. He is active. He is affectionate. He is silly. He is intelligent. He is kind. He is polite (lots of please, thank you, you're welcome, & excuse me). We love watching him grow and can't wait for another year! Happy Birthday Liam! He is tall and lean! Noah is super tall but is on the high end for weight too lol. I will be sending out good thoughts for Liam (and Noah) to continue getting better at sleeping. We better be writing something different when they are 3! Why must they grow so fast?! Whyyyyyy?! He is SO cute!! Love the "holy moly!" He's so cute and looking like such a little man now! Precious!! That's awesome that he enjoys doing puzzles,that's great for them!! Be proud of your polite boy - I didn't realize how rare that is sometimes and is also something we value in our guy. :) Good job Momma and Dad! !